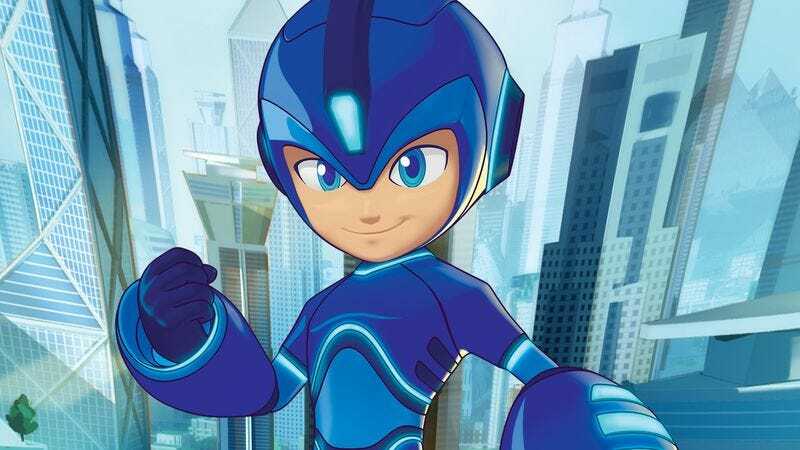 In 2015, the Japanese production company Dentsu Entertainment broke the news that it was developing an animated series based on Mega Man, Capcom’s iconic video game hero. Dentsu and Man Of Action Entertainment, the animation house tasked with writing and producing the show, hoped to launch it in 2017 on the Disney XD channel, but a new announcement from the series’ handlers notes this original Mega Man series has landed at a different home. Called simply Mega Man, the new series has been picked up by Cartoon Network and is currently slated to premiere in 2018. From the sounds of the press release that accompanied the news, the series is aimed squarely at a new generation of Mega fans-in-waiting. Mega Man will still be a robot, but he’s actually just the alter ego of Aki Light, “a normal, upbeat, schoolboy robot who has nano-core technology that allows him to transform into the mega powered super hero Mega Man” who battles the villains of “Silicon City” while also trying to “maintain a regular robot boy life.” Rush, Mega Man’s trusty robo-dog sidekick, will also returning in some capacity, alongside several new characters. And yes, that’s a photo of the new Mega Man atop this article, in all his nightmarishly proportioned glory. He’s definitely a far cry from the weirdly buff version that appeared back in the original Mega Man cartoon.